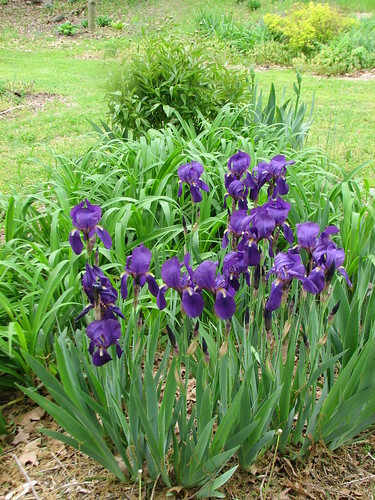 The old old purple irises from DH’s family farm are always the first to bloom in our yard, along with the few early dwarf iris. Those vintage purple ones were blooming well when this picture was taken May 1. 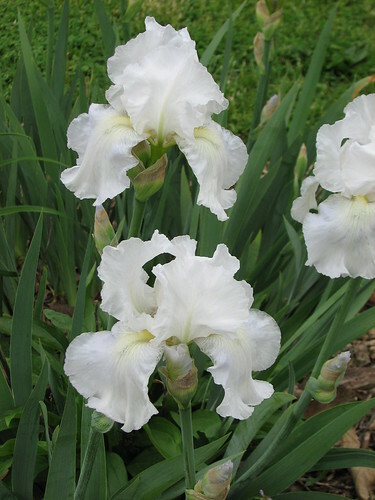 This small vintage iris came from the family homestead of DH’s great-aunt Lydia. 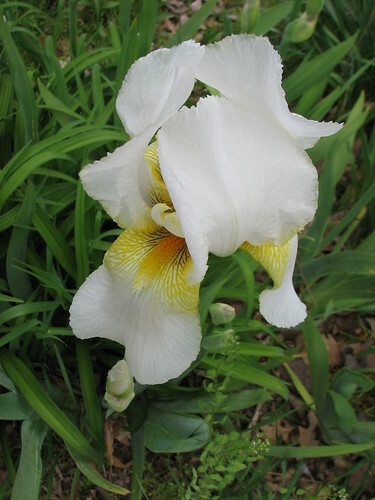 The house is no longer there, but several years ago, as we drove by, we spotted these little white irises growing among the weeds and we liberated a few to bloom in our own yard. 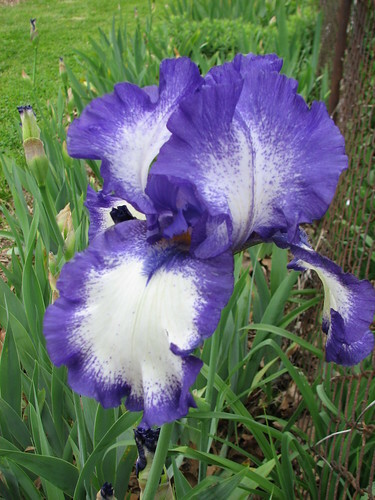 And then there is ‘Immortality’…one of my very favorite irises. It smells wonderful! 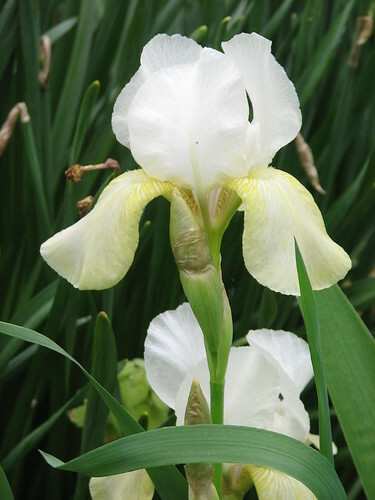 It’s beautiful, early, prolific and, as an added bonus, it is a rebloomer, given enough moisture. Because we don’t water the gardens once plants are established, we had no reblooming ‘Immortality’ last year due to the summer drought. I hope that is not the case again this year. 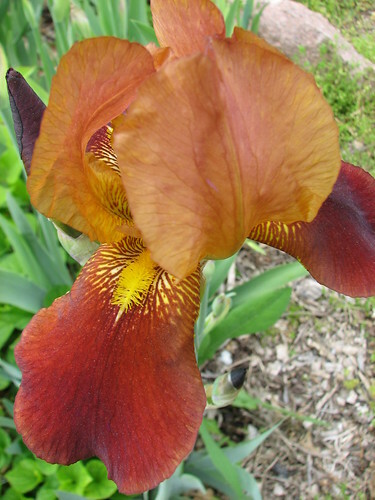 This little brown iris was in the yard when we bought our home in 1994. Planted against a brick wall of similar color, it was lost. We’ve moved it around the yard and appreciate it’s early bloom. In the excitement of the robin rescue, I forgot to get a picture of ‘City Lights’ which also opened today. I’ll snap that one tomorrow. This entry was written by ~~Rhonda, posted on May 6, 2008 at 11:28 pm, filed under our garden, spring and tagged flowers, garden, iris, spring. Bookmark the permalink. Follow any comments here with the RSS feed for this post. Post a comment or leave a trackback: Trackback URL. Those are so beautiful Rhonda!! I was sad to realize I planted the wee little iris you gave me that bloom very early in a spot I missed seeing till the blooms were partly wilted 🙁 But my Immortality are in bud! I absolutley love the raspberry blush above! oh my! The purple with the white shadings is also very showy! Wonderful! 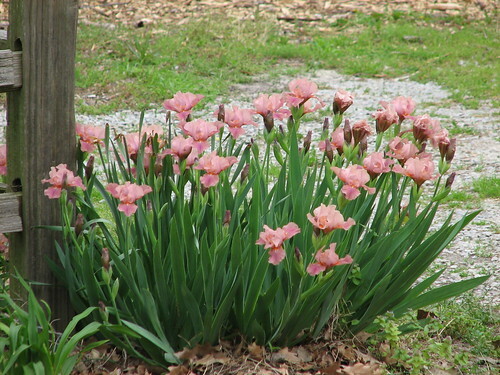 I have some purple irises ready to bloom. They are probably from you! Your photos are beautiful.